A question I often get is “Can you tell if this DNA match is my uncle or my half-brother?” Why this question? Because it is very difficult to tell the difference between a half sibling and a nibling (an aunt/uncle/niece/nephew) relationship from the amount of matching DNA. Like grandparents, they all share 25% with you, or about 1750 centimorgans (cMs) give or take several hundred. Unlike grandparents, the age difference can’t usually be used to tell them apart. The testing companies might call him “close family”, “first cousin,” “uncle,” or the more descriptive “1st Cousin, Half Siblings, Grandparent/ Grandchild, Aunt/ Niece” from Family Tree DNA, which by the way is my Dad’s actual great-niece’s designation. Then they show you the amount of shared DNA in centimorgans and maybe a percentage, but really they are just making an educated guess about the relationship. I wanted to find a way to help adoptees figure out more accurately which relationship a new 25% match was likely to be, so I collected detailed statistics using a google form for about a year, getting some 2400 responses. These were self-reported from people who read my blog or are members of groups on Facebook where I publicized this. I am still collecting, so feel free to add yours to my form (click here) to get included in the next report. GEDmatch numbers preferred. My experience from helping people understand their DNA results had led me to suspect that segment sizes were the key to telling these relationships apart. I had noticed that the sizes of the four largest segments would usually be much much larger for half siblings than niblings. However now that I have these crowd-sourced numbers, I can see that much of my personal experience came from helping with paternal side cases. There the segments are consistently much larger. Can you tell a nibling from a half sib by the shared number of segments and centimorgans? The collected wisdom of the many adoption search angels is that the number of segments can indicate the difference. While this usually works for nibling versus grandparent, half siblings too often seem to fall in the range of one or the other. The DNA adoption folk have a chart which shows the number of segments expected for each relationship (click here for that PDF) which is very useful, just not enough for determining half siblings. They carefully separate the AncestryDNA results which can have more segments and fewer total centimorgans due to the removal of some matching data deemed less significant. DNA adoption also has an automated relationship estimater based on that data. Leah Larkin recently wrote a fascinating post – Escape from the Overlap Zone – which showed simulations for these relationships which indicate that grandparents can easily be told from niblings since they have far fewer total segments. However again, the simulations show that half sibs and niblings have considerable overlap. So how does the collected data compare? Here is a scatter diagram graphing total centimorgans (X axis) versus number of segments (Y axis) for just grandparent and nibling relationships. This used only the GEDmatch data for consistency. The niblings are the lavender color and the dark results show where they overlap with the beige-pink colored grandparents. This is not far different from the predictions although there is more overlap than expected but look what happens when I add the half-sibling data below right. The graph is hard to read now since those results overlap both categories. The colors are semi-transparent so the darker areas are created by having multiple colors in that area. There seems to be considerably more overlap than the simulations predicted. It looks like just using just shared centimorgans and number of segments will not produce a clear answer as to whether a 25% relationship is a half sibling. Notice the funny shape of the half sibling blues. There is a bunch on top with the niblings and another group with the grandparents. Fortunately someone had suggested that I include a question asking which side a relationship is on, paternal or maternal. So I decided to look at the scatter graph for maternal (reddish) versus paternal (blue) half siblings. The difference was quite startling. Maternal half siblings looked like niblings while paternal half siblings looked like grandparents in the comparisons of centimorgans versus the number of segments. However there are only about 100 data points in each set, so I will look again in a few months and see if this difference holds up. 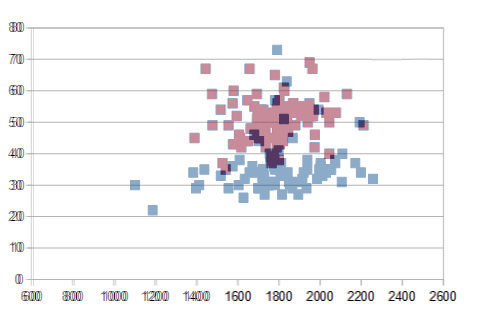 When I looked at the maternal versus paternal for the other relationships the paternal were only very slightly larger. What else can we use to tell niblings from half siblings? What I have seen in the many results that I have looked at over the years is that if all other indicators are ambiguous, the sizes of the four largest segments can indicate which relationship it is, that half siblings will usually share between two and four segments over 100 cM. While this works almost all the time for paternal half siblings, it is a closer call for maternal half siblings versus niblings. Yes, most of my cases have been paternal. Here is a visual; I used the median rather than the average although those numbers are practically identical and I used the entire data set, not just the GEDmatch numbers since the largest segment sizes will not vary between companies. The third and fourth largest segments are the most consistant when I looked at the range of results (not yet published). In my experience, another indicator of a half sibling is having one or two fully shared chromosomes whereas a nibling relationship rarely has any. This seemed to fit the small amount of valid data I got. However the question on my form must have been confusing since I got answers like 21,22, and 23. I have now changed it to a checkbox – 0,1,2, or more. Maybe that will work better for the next analysis of this data a few months from now. The other problem I saw was that I had six outlier answers for niblings on the very low side, about half as many centimorgans as expected . Blaine Bettinger explained that he saw the same thing and the likely answer is that they are unexpected and unknown to be half relationships, so I did not include that data. By the way he has just published a new version of the shared centmorgan project so click here for his latest results. Is there anything else? Yes, the X chromosome can help. Half sisters sharing a father will share an entire X chromosome (click here for that blog post) which is exceedingly rare in a nibling relationship. There are cases of maternal half sisters sharing a full X, not many though and this more likely in endogamous populations. Please help me collect X statistics for close family members to see if that can help in these cases as well. Click here to add yours to my form. My results are from hundreds of data points. There are always outliers. If yours differ are they just your family or from many cases? I sent you an email. Wouldn’t the results of the last scatter graph (maternal vs paternal half-siblings) be expected?. The production of a human sperm cell averages 27 recombinations (per ISOGG page on recombination), while the production of an egg averages 41 recombinations. As a result, wouldn’t we expect fewer and longer segments from paternal grandparents, and more but shorter segments from maternal grandparents. This would result in paternal half-siblings having fewer but longer matching segments than maternal half-siblings as shown in your diagram. I imagine a scatter graph between 1st cousins whose fathers are brothers vs 1st cousins whose mothers are sisters would also show a similar difference, with 1st cousins whose parents are brother/sister somewhere in between. Expanding on my hypotheses of paternal vs maternal half-siblings a quick calculation (which ignores the X and Y chromosomes and the varying rates of recombination on each autosomal chromosome) I would expect to see on average (41+41+22)/2 = 52 matching segments for maternal half-siblings and (27+27+22)/2 = 38 matching segments for paternal half-siblings. This is pretty close to what your scatter graph shows. Interesting about the half sisters possibly sharing a full X but more likely endogamous related. When I was trying to determine if my mom & her sister (now confirmed maternal half-sister) shared the same father, I was confused by the fact that their X was nearly identical, except for a few tiny pieces missing. They are maternal half-sisters, not sharing the same father at all. But maybe their fathers were distantly related as they did have ties to the same island. I also saw distant relatives, a brother & 2 sisters all having the same mother & different fathers shared an entire X.
I’m still trying to get my paternal half-brother and my maternal half-sister to get tested. I tested 2 maternal half-brothers, and have a full brother out there whom I know will not get tested. Yes Kalani, my statements on those shared full X not always being paternal sisters are from your data! Thank you for sharing this and for your ongoing work. Here’s my scenarii. My father is deceased and he had no siblings or first cousins. My brother and I have both tested as I am trying to trace our paternal line back and find the parents of my paternal 2nd great grandfather. My father was married prior to his marriage to my mother. That union produced 2 daughters, my half sisters. Both are deceased. However, those half sisters did have children. Here’s my question. Would testing my half nieces be worthwhile in trying to create more paternal DNA? I have created a paternal phased kit on GedMatch for my brother so we know which matches for him are from which side. I had an aunt that always believed she really belonged to her sister, my mother, because of things my grandfather said. My grandfather was far from reliable. I had her dna done before she died, she wanted to know whether it was true or not but of course I couldn’t tell. I’ve done my own, my half sister, this aunt and two cousins, dna on Ancestry and uploaded them all to gedmatch. I keep going back to her dna and looking for signs. It just hit me the other day, she seems closer to one of my cousins than to me. I’m wondering if she really belongs to my aunt. My head has quite a bit of trouble understanding and interpreting and I am hoping to get some clarification (before you drink your glass of wine, LOL). Erika (me), Hans and Massimo (both male). They all have a common MRA, Henry, deceased. Erika and Hans are siblings, Massimo, I think, is a first cousin once removed of both, i.e. the next generation. 23andMe says they are first cousins. The question is whether it is possible that Hans is not the son of Erika’s father Max, but of Erika’s father’s brother Val, and if so, what kind of relationship would it be between Hans and Massimo (e.g. half nephew/half uncle). Also, how confident can you be, based on these numbers? I cannot figure out the difference between the two men’s segments and cMs and Erika’s, i.e. Hans to Massimo’s largest segments smaller and cMs larger than Erika and Massimo’s. I am a real beginner and enjoy reading your articles and the blog, they are so well written and helpful, but right now I am stymied. Many thanks for looking at this and guiding me? If this port is inappropriate here, where else could I go? The key to the full versus half question is the fully identical regions (FIRs), aka completely identical segments. So look at those. That is an area where you each got the same DNA from both parents thus it is identical on both chromosomes in the pair for a stretch along the same location. When you are 3/4 siblings or double first cousins you will also have some FIRs, just not as many. You can see this at 23andme or at GEDmatch. At 23andme you have to get to the full DNA comparison to see it which is not intuitively obvious. Easiest is to look at your match to Massimo then scroll to the bottom of the page and click on the yes next to your brother. This feature is not on a smartphone though. You would expect about 25% of your DNA to be fully identical with a full sibling, so about 900cM. You have inspired me to collect some statistics on this so stay tuned for my net blog post. I share 824cM with my own full sibling by the way. I do not look at ancestry composition for this unless it is wildly different. Wow, Kitty, I did not expect a reply so quickly – thank you so much. Now, however, comes another hard part – doing what you told me to do. Let me see what I can come up with, and then I may have to ask you again, at least to corroborate. I also sent you an email for you to send me the kit numbers at GEDmatch or GENESIS but obviously better if you do it yourself! My sister and I share 1923 matches and cousin 3289 matches. WHat does that mean Why is my sister and I have fewer matches than my cousin and I? Kitty: I have learned so much in the last few days, mainly thanks to reading you writings and your suggested links. Fantastic (but lots more to go if I want do more). I have written up what I understand and I hope you will critique it, both positively and negatively. I have written it so I can send it on to the people involved in this quest. The original question was: Is it possible that Uncle Val might be Hans’ father? Val is our father’s brother. The cMs for Erika and Massimo are 697 and for Hans and Massimo 758 (23andMe numbers). 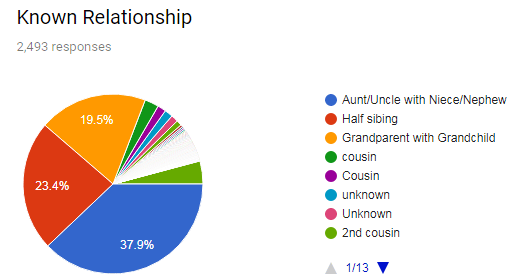 It seems to me that the fact that these numbers also fall into the categories of half-aunt/uncle and half first cousin is irrelevant because there is no doubt (based on their fully and half identical overlapping segments and cMs) that Hans is Erika’s full sibling and not her half-brother. However, the numbers are rather low for their categories if compared to the table from the Aug.2017 version of the Shared cM Project, which may be interesting in and of itself but probably has no significance in the case at hand. I’d like to know whether you can do anything with our numbers as you intimated in you previous reply. Many thanks for looking at this. AndI will email you the GEDMatch kit numbers in case you want to see them. I’d like to refer back to my post of January 20 and your reply; I still have questions. You agreed that Erika and Hans are siblings (acc. to 23andMe 44.8%, 2535 cMs in 40 segments). The original problem was to ascertain whether there was a possibility that Hans was (instead) the son of Val, our father’s brother and Massimo’s grandfather. We know now that that is not the case, but I am confused about the numbers for the two gentlemen. Massimo is a 1C1R (proven), I remember him as a baby. Actual Centimorgans for both are way above average, but well within range, 700 for Erika and Massimo, 747 for Hans and Massimo. Percentages of shared DNA are well above the expected 1C1R percentage of 6.25%, 9.36% with 19 segments for E and M, and 20.2% with 24 segments for H and M.
Am I on track, do I understand this, do you think? Can you say that these are just outliers? Or is there something I don’t know? I looked at all the longer segments on all chromosomes. Hans and Massimo have good overlaps on chr. 5, 10, 16, and 19, ranging from 55 to 105 (rounded). Erika and Massimo overlap on chr. 2, 4, 5, 10, 14, ranging from 50 to 107. My next project is to try to find some info on some 18th century cousins, because I may have a DNA Relative with 0.22%, one segment on chr. 18 That makes me suspect or hope that I may find something. She is a fourth cousin supposedly, which would fit. There were two young men who ‘were lost in the Levante’ ( I guess as mercenaries?). Would that not be a find? Lots to learn, even if I end up empty handed. Correction, …and 10.2% with 24 segments for H and M.
This information is so very helpful. Without your expertise and that of so many others, situations like Erika’s can be solved. That leads me to my own situation/conundrum. I have struggled with reaching out for help, but I just can’t seem to reconcile all the data to fit or disprove what we assume is a half-sibling relationship. I see above that you are quite busy. I would be quite grateful if and when you have time, you could shed some insight. Of course, I am more than happy to share here whatever info might be helpful. My mother who is 85 yrs.never new her birthfather. She new her Mom ( there were rumours that her mother had another child) however my mom grew up an only child. We found out who her birth dad was on ancestry/my heritage and that he had a son, mom’s half brother who has passed. Recently thru 23and me she found a 1st cousin who was adopted and knows nothing of her birth family. She is 57 yrs. I’m wondering if they are first cousins or perhaps aunt/niece half siblings. Cm is 1294 over 23 seg 15cm are over 40 of those 4 are over 100 the largest is 114.48 and shared DNA 17.4%. They share no x chrom. I am not sure what all of this means so would appreciate your help please. She is most likely your half niece. If you both upload to GEDmatch (or GENESIS at GEDmatch for recent 23and for recent tests). Did your late half brother have any children who would test? Thank you so much for your reply. I have been unable to find out if my Mom’s half brother had any children, also my Mom possibly had other half siblings that we are unaware of. It is exciting if this person is a half niece. This will be the closest relative that we have found on my Mom’s paternal side that is living. I will take your advice to see what else we can discover. Thank you again for your help I really appreciate it! Based on what I have read the X match should mean same father so the Granddaughter should be read as Half Sister. Un less I am missing something. My Mother was adopted we have birth mom information and this person best of my abilities is not related to the common matches of family names. Yes that sounds like a half sister shared Dad if it is a full X match- how large are the four biggest autosomal segments? If several are over 100cM then congrats. Best to save all this person’s information before you contact them in case. Do they have a tree? Great blog! I have learned so much in a short amount of time. I have always been fascinated by genealogy and now I am with the science. I just recently received results from ancestry that I have a “Close Family” with “Extremely High Confidence,” sharing 1835 centimorgans across 53 DNA segments. They guesstimate as a 1st Cousin. I finally tracked down this person to find out that in fact…he was adopted, born in the same area and even hospital that I was born in, 4 years prior. His birth records are sealed so has no other information. My father was the youngest of 7 of 13 adult surviving children and my grandmother would have been in her mid 60’s during this person’s birth (so I know it is not an uncle). My father’s next youngest sister had two sons already and I am pretty sure unable for any more after that. The next youngest was no longer living in the area. I am told his only brother was sterile and unable to have children ( I know he had no biological children) and the other sisters had established families with living relatives who would have been around and could confirm a out of wedlock pregnancy and then adoption…there were none. That brings me to my father. He had just returned home from the service where he was stationed overseas and was back in his hometown at least a couple of months before he met, became engaged and married my mother in a very short timeframe. The birth year of this person coincides with that. Both of my parents are deceased, but we are certain that if he knew, we would have known…or at the very least, his sisters (two still living) would have known…and they know of nothing. I realize that getting both of our raw DNA files to GEDMatch is the key next step, but I am letting the info settle in with all concerned, before I ask to go further and before too much is stirred up over potentially nothing. Now to my question…based on all you know and for that strong of a match, knowing it cannot be an uncle, or a grandparent, or even a 1st cousin from all I know (plus my known first cousins on ancestry are less than half the centimorgans across an average of 36 segments)…is this person likely a half sibling? Is it a strong enough match to presume such and move to more testing? Congrats on your new half brother! Your reasoning seems sound to me. Are other close paternal relatives tested? You might see how much he shares with them. You can both look at your raw ancestry test data to see if your Y matches. You could each open your test data in a spreadsheet, making sure tab is specified as the delimeter. Then cut and paste all the data for the chr number 24, which is actually the autonomous Y, into a separate CSV file. Use a file comparison utility like BeyondCompare to compare them. They should be an almost perfect match since you have the same Dad. Hmmm, perhaps I should blog about how to do this at some point. Love your blog! New to dna so here it goes. I’m an adoptee recently connected with a “close family member” through Ancestry. 1748cm, Ancestry/1802 GEDmatch. Following all leads (history/location of parents) we believe we are half sibs, his known first cousin tests to me as expected at 13.8% shared dna (don’t have the cm yet), his father’s brother tests as expected as my uncle at 2105cm, his daughter who would be my cousin tests as expected at 956, her sister tested high…we share 1400 cm and aren’t sure why…thoughts? We do not share an entire X chromosome so we can rule her out as half sib? Plus her father tests as my uncle.) My actual question though is regarding your blog post “half sibling or nibling”. You state “The sizes of the 4 largest segments can indicate which relation it is because paternal half siblings will usually share between 2 and 4 segments over 100cm. We share 6, well over 100cm if I’m reading the chart correctly. You also mention that another indicator of half sib could be having 1 or 2 fully shared chromosomes, nibling barely has any. How do I view or find out if we have any fully shared chromosomes? His father has passed so cannot be tested. If you share 1802cM at GEDmatch plus 6 segments > 100 cM you are paternal half siblings. Don’t worry about having fully shared chromosomes, that was just an observation not yet validated scientifically. If you click the “graphic only” on the one to one compare at GEDmatch and then see any chromosomes with a solid blue bar all the way across that is a fully shared chromosome. Also do a one to one image only with the 1400 cM daughter to see if there are any grenn bars – perhaps you are related to her mother? Or some could be false, get the numbers in a spreadsheet and see if any are randomly larger than with her father or not even in his results; those will be false. Yes 1400 is in range for a half niece but that is such a large portion of what you share with her Dad that it is unusual but not impossible. You are amazing! Such a quick response, thank you. Just to be sure (I’ve made many mistakes during this learning curve) what I’m viewing on GEDmatch is the one to one “autosomal comparison”. Too of the chart shows chromosome 1, start location, end location, centimorgans, then snp’s? Does this sound like I’m viewing the correct info on GEDmatch. Also, thank you so much for the info regarding the 1400 cousin match. …I checked the chromosomes at GEDmatch and we have one solid blue bar, and another very close to solid. I did notice on the one to many comparison it states we share the 1802.5 total cm I mentioned but the one to one comparison shows 1799.8. I’m guessing this small difference is of no concern? small difference not of concern, the one to one is more accurate (only uses 7cM and larger) while the one to many includes some smaller segments. I recently had 23&Me DNA test conducted and discovered that I share 23.6% DNA with a female. DNA company predicted she might be my grandmother but after we spoke she indicated I was older than her two sons and this isn’t a possibility. Perhaps she is my half sister or aunt. Can you please let me know how to determine this? She could be a aunt or a niece or a half sister. Else look at the charts above, number of segments, total cM and also what are the 4 largest segments? If she is a maternal half sister, it is not very different in the DNA from an aunt or niece so best is to ask if she has cousins or other family members who are tested. Those tests may narrow it down. Do you both know who your parents are? I am overwhelmed with the clear and perfectly explained info here in your blog. I have been googling info since last Friday and now that I have found your Blog, I am finally understanding this new language. Thank you. After going through all your info, I guess my next step is GEDMatch. While I am absolutely sure that this match is my Father’s side (not 1 maternal shared relative), I am not certain on family relationship. I believe the relationship to be 1/2 sister. My Father is deceased as well as parents of my match. Verbal confirmation is not 100%. My Father and his brother (my Uncle) worked in the same store 47 years ago. My matches Mom did too. While I believe my Uncle, can I be certain he is not the father. My “close” family member and I share 1423cM shared across 53 DNA segments. I believe this to be too high for cousins. I appreciate your thoughts. Thank you Kitty! It is theoretically possible for that large amount of cM to be a cousin but no one I know has ever seen a cousin match that large. So yes, a half sibling. If you both upload to GEDmatch and find that you match for the entire X chromosome as well as have several segments > 100 on chr 1-22 we can be confident she is your half sister. I share 18.8% on DNA with this woman and 1397 cM over 34 segments. My father shares 29.8% DNA and 2217 cM over 41 segments with her. Thank you for any help. Hello Kitty – just more information as I try to understand this better. My father and this woman share 5 segments over 100 with a 6th at 93.9. Then this woman is most likely your father’s half sibling via his Dad. Did you look at this match on the DNA comparison? Are there any fully indentical segments? This is quite a high match, almost high enough to be a possible full sibling or perhaps a half sibling with a related mother? She has met her bio-mother so we’re pretty sure it was not my grandmother. Possible fathers could be my father (but I don’t think he shares enough), my uncle (he is deceased) or my grandfather (deceased). We were wondering if there was a double DNA connection somehow – like her bio-father and bio-mother were related as 2nd cousins or something? Thank you for taking the time to review the data and analyzing it. Your expertise is greatly appreciated. I will surely be contributing towards your ” HOW TO THANK ME”. If this would have been a aunt/niece relationship can you explain what evidence would show up in the DNA data? Again thank you for unraveling this mystery. I have never seen a full X match between an aunt and niece although theoretically possible. Also there will not usually be more than one segment > 100 cM if any at all. Thank you again for all your work and time, have a great Saturday! I did the ancestry dna test 3 years ago, for all of my 44 years I believed a certain man was my father, he had told me his half brother (same mom different dad half siblings ) was actually my father. The man I thought to be my father has passed away. I did have a match that’s my closest dna relative on the list, she is his half brothers daughter. On ancestry we share cm across 22 segments. The only other relative that’s even as close as she is, is my mother’s sister. I even found that I have matches to the half brothers biological dad. I don’t see how that could be possible if the man I was told was my father because I should be showing relation to his dad’s family and I do not have a single match for his relatives. What’s so confusing is that the woman I match it says she’s my 1st cousin, we share 473 cm on 22 segments. My mother’s sister and I share almost the same amount. I’m aorry this is so confusing it’s hard to even explain lol if you could offer some insight into this I’d appreciate it. Also I did upload my dna to another site and it gave much higher amounts of cm than the ancestry website did for matches that were also using that site. From what you are saying, if he is your Dad then his Dad was not his biological Dad which is why you have no matches to that family. It sounds like his half brother may have been a full brother after all. Or your dad’s bio dad was related to his half brother’s dad. Also, if you only share 473 cM with your mother’s sister, they are not full sisters and that is even low for a half aunt. But as you have discovered, the totals are lower at ancestry. This is because they remove matching segments that are likely population specific from the totals. You are amazing! Thank you for the work you do answering so many questions. I hesitate to ask mine but I find no where else to go. So, if you’re too busy I’ll understand. I’m trying to determine if a man is my half brother. We share 1,299 centimorgans. Our longest block is 189. It looks like all the charts say we need to be above the 1,300 mark. Also we share nothing on the X.
I do share X with a paternal half niece. Is this normal? If you share a father, you would normally share no X unless your mother’s were related. If you share a mother, it is possible to share no X but unusual. Although that is low, it is not impossible. 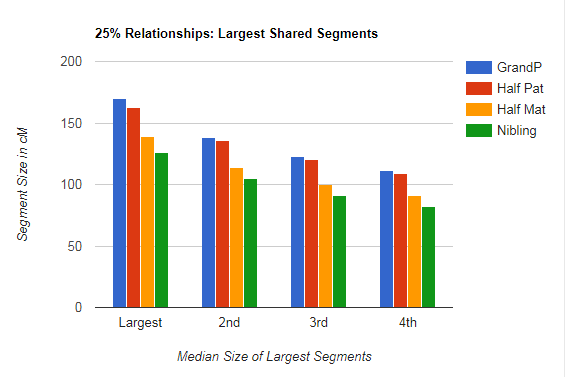 What are the 4 largest segments you share? I have sent you details via e-mail (including kit numbers from GEDmatch.com) for the results of myself and my half-brother or uncle. Each of us is an adoptee. If you wouldn’t mind taking a look at them I’d appreciate it. Great work. Thank you, Kitty. You have helped me so much with my FIL and now I am trying to help my mom find her dad after other tests confirm the father on her BC is not her biological father. My mom had three possible 1CXR show up on AncestryDNA (569cM, 418cM and 413cM). They all share the same great grandparents. The great grandparents had two known sons, one b. 1913 and the other b. 1919. My mom was born in 1942 in the same geographical area per census records. The 562cM match w/27 segments is the grandson of the son b. 1919. The others are descendants of one of the 6 daughters of the great grandparents. Are his cMs too low for this grandfather to be my mom’s father, so this brother is most likely the uncle? I reached out to a son of the son b. 1913. He tested at 23andMe, and matches my mom at 1715cMs with 29 segments. My mom only has her AncestryDNA test uploaded to 23andme, so I can only do the DNA Comparison tool. Several others in the 90’s cMs range. The match is not on Gedmatch, only 23andme. This match also matches me at 822 cMs with 28 segments at 23andme, with a predicted relationship of 1st Cousin there. Is this my mom’s half-sibling or her uncle? Thank you so much for helping me figure this out! I was hoping you could help be be certain. I believe I have found a half sibling. We believe we share the same father as she matched with my !c as a !c and my daughter as a !c. She did ancestry, I did 23&me. We uploaded into Genesis/GED. We share 94.8% on X-DNA. We believe we share the same father as she matched with my 1c as a 1 c and my daughter as a 1c. She did ancestry, I did 23&me. We uploaded into Genesis/GED. I have received a match from 23 and ME of: 10.8% shared per 23andme, or 803 cM over 22 segments. My question is: can this set of matches distinguish between a half sister (on my father’s side) or a 1st cousin ( on my father’s side; a daughter of my uncle)? By the numbers that could be either a half niece or a first cousin but not a half sister. Segment sizes are likely bigger for a half niece and certainly bigger on the paternal side. Other family tests can help tell which perhaps. I just clicked onto 23andme new relatives and was told unequivocally that I have a half-sister, which I certainly did not know before. This person listed a family surname shared by my mother, so I immediately assumed my mother birthed a child she never told us about. However, this person and I do not share a maternal haplogroup, which makes it impossible that we share a mother, right? (I am H2 and she is K). We share 19% DNA and share about 2/3 of the X chromosome. She does not seem to know who her father is. What is the chance she is my half-sibling vs an unknown aunt? And isn’t irresponsible of 23andme to declare I have a half-sibling if there is an equal chance she is my aunt? Does your mother have a brother? Do you have other relatives at 23andme you can compare her to? Can 2 males that are predicted half siblings still be potential 1/2 siblings if they share 23cm’s, 2 segments in the X, and completely identical? In addition the 2 men share 1699 cm’s, 53 segments. I guess with this info there is no way to tell if they are indeed 1/2 sibs or uncle/nephew. Correct? That number is definitely a 25% relationship, nibling, half sib, or grandparent. The problem is that Ancestry removes population specific matching areas which can result in a smaller total cMs and a higher number of segments. You need to get both kits uploaded to GEDmatch and compare there to use the various charts in this article. The X match would tend to indicate that they are related on their maternal side BUT if their mother’s are distantly related it could be a red herring. Thanks for the reply. I should have said that this match is through 23 and me. The 2 men share 23.1% DNA. Further, the son of one of the men shares 11.7 DNA with the other man across 22 segments, and 870 cm’s. Also, not sure if this is noteworthy, but the two men share 100% (1/2 identical) on the 20th chrome. So what are the four largest segment sizes? subtract off any segments less than 7 cM as well as the X match and then look at where that total sits on the chart above. The totals you gave me makes them either maternal half sibs or niblings. The son’s match is consistant with that too. So segment sizes may suggest which is more likely. I have been trying to figure this out for months 🙁 My Father in law was born and adopted in 1942. My Husband did a 23&me test a long time ago, and had a few close matches. Recently, we were able to get my father in law to submit DNA, and the former close match for my husband came back as a predicted 1/2 sib for my FIL. The predicted 1/2 sib was born in 1951. So, relatively certain (I think) that they have to be 1/2 sibs or niblings, based on the birth years. I got my Father in laws DNA uploaded to GEDmatch, and my husbands is already on GEDmatch. I will try and get the predicted 1/2 sibling to do the same. I think we all believe that the relation is through the maternal line. I am confused about the potential nibling, though. I am assuming if they are nibling’s then my Father in law would be the uncle of the match. BUT, to be the uncle, I think he would have to be a sibling of the matches mom….Which if I understand this correctly, (and I likely don’t) would mean that my FIL’s Bio mom would be the grandmother of potential match. But She would have been 59 or 60 in 1942. I hope what I am saying makes sense, and is not too confusing. I just really was hoping to figure this out. The numbers could still be either but the dates make it clear that they are maternal half siblings. For your FIL to the uncle, he would have to be the full sibling of the match’s mother which sounds like it is not very likely. Is the half sibling’s mother available to test? By the way, if they share a mom, then the mtDNA haplogroup which 23andme shows should be the same, is it? No, unfortunately she is not. She was born in 1924, and passed away in 2000. My Father in laws haplogroup is H1c, and the predicted 1/2 sibling is H1c1. I wondered about that as well. Well those are practically the same. H1c1 is a subset of H1c and may be only a single mutation away so yes they can have the same mother still. Of course they would also share the same mtDNA haplogroup if your FIL is the full brother of the mother of the match. Are there any other relatives on the matches mother’s side that could test? When did each person test? Therefore which chip? Thank you! You have no idea how much this is helping. In addition, I am learning A LOT by reading the articles and other posts. As far as relatives on the matches mothers side….. Yes, his sister is submitting testing. Also, his daughter is in the 23andme data base as well. Also, his mothers siblings granddaughter. (And I think I already wrote this, but my husband shares 870cM/s with the “match” across 29 segments. Also, my daughter (granddaughter of FIL) shows a match on Ancestry to the matches first cousin on his mom’s side. The match is 285cm’s 13 segments. I forgot to answer your question about when they tested. FIL-results just came in this week. My husband- over a year ago. And the match and his daughter I’m guessing 6-12 months ago. The reason I askes is that 23andme changed the chip it used in Aug of 2017, so if any of these people are on the new chip, it can affect the results. Hmm…interesting. Kitty, Thank you for all of the info! Tremendous help for me with this scenario and others. I have made several visualization documents, but nothing as organized as the McGuire method. Thanks for the tip, I will do that next. I think getting the matches sisters DNA should be helpful too. My FIL and husband have their DNA already uploaded to GEDmatch. Hopefully, the match will upload his. At that point…I might reach out if I have any questions, assuming that is all right with you. Incidentally, my interest in genealogy started with my own 23 and me test 10 years ago. My mom did one as well…. a few years after me. Last fall my mom found a 1/2 sibling (complete shock) that was born before her dad had even met her mom. He was Conceived in England during WWII when my grandfather was stationed there. They shared a lot of cM’s , as do I with her 1/2 sib. (2019 across 31 segments and 1350 across 30 seg’s, respectively). So, with my FIL it has been a bit more complicated with a lower number of cM’s and a much higher number of segments. By the way, the above chart is helpful with that. When I deducted anything less than 7, my FIL and the match came up with 48 matching seg’s. Again, thank you for your time, tips and resources. I’m yet another fan of your blog. Thanks for helping us all puzzle out our dna. I am interested by the dna shared by cousins. My paternal 1C and I share 1126 cMs on 39 segments, longest are 109, 84, 78, 60. Our fathers were brothers. Our shared dna seems high. What do you think? I’m fairly certain we have correctly identified our parents (we were conceived far away from each other in time and space). We know that this side of the family had at least one uncle/niece marriage (my great aunt). Our great grandfather and his brothers came from a small German village – maybe 1C marriages were more common… Are there any online references in figuring out dna from overly related parents? That is high but in range for a first cousin. Also paternal side tend to have larger segments. I uploaded my DNA to My Heritage as one of the places you recommended. My results on Ancestry showed 1533cM with 47 shared segments with a match. We both matched on My Heritage again, now being 1537cM (21.3%), shared segments of 29, largest segment is 159cM. My Heritage is suggesting uncle, half sibling. From the beginning of all this (Father’s Day weekend ironically), we both thought half siblings because none of the other relationships would be possible for us. I am 46 (female), he is 66. My dad had four marriages, traveled for work and always seemed to be in a relationship between marriages also. My dad had 2 brother’s but we know one of those brother’s couldn’t of been the father. We thought ok, either my dad or possibly my other uncle but here’s where I question, if my uncle on my dad’s side was the father of this man, I believe the cM level/largest segment would be too high for 1st cousins as one of my 1st cousins on my mom’s side came back in the six hundred range for one of my matches. We narrowed down we can’t be an aunt or uncle to one another/ grandparent, niece or nephew. This match was adopted so we know for sure we’re related on the paternal side because he’s been trying for decades to find out who is birth father was because his mother left “father” black on his birth certificate. He located a half sister & she told him that her & two other siblings had a different birth father than him & their bio mom liked older men. His bio-mom only kept that oldest daughter & gave up her other 3 children for adoption. My dad would have been 14 years older so that makes since. I’m believing this man & I are half-siblings but even though you said Ancestry tends to show less cM sometimes, ours stayed roughly the same between Ancestry & My Heritage but the shared segments dropped from 47 to 29 on My Heritage. You did say the shared segments would probably be lower elsewhere but that seems like quite a drop. I read an article that the author stated the number of segments that two siblings share is based on chance. He said cM levels are the most important and the largest segment shared overall. The only other thought that came to both of us is “what if” my grandfather went & visited my father and God forbid but had been with this man’s birth mom as her first 3 children were by a man twenty plus years older than her. Mind you, this is a far out thought because my grandfather would of been 37 years older than this man’s mother but it’s still possible. If that did happen, that would make this match a half uncle to me. Again we don’t think this is the case but things happen so we had to throw that out there but would this match and I be at the levels we are if he were my half uncle? Also our largest segments are:159cM,155cM,134cM, 120cM, 109.5cM & 100.5cM. We’re also waiting on a 23andMe result (only 2 weeks out now). This match had the kit sent to me after he we talked more & I was ok with that. We’ve exchanged a lot of emails & I really want to help him find his answer on his birth father, who is looking to be my dad & with him searching for decades & being this close I can tell it would mean a lot to him. I hope you can help with thoughts here on this until we receive the final results from 23andMe. I know this was a ton to explain & I know you are a very busy person answering all these questions for people. Please know I appreciate you answering my email so very much when you have the time. Sincerely Darleen. With those largest segment sizes you are clearly half siblings with the same dad. That’s what I thought from trying to learn all of this and to think I was only taking a ancestry test to confirm my countries of heritage and found a half sibling. Thank you so much for taking the time to read my letter and respond. Darleen. Hi Kitty. I am attempting to determine who my paternal grandmothers parents were. She was an adoptee. I have separated matches from side A and side B. Highest match on side A is 328 cMs across 18 dna segments. My current hypotheses are my grandmothers parent is either that matches father, or the fathers half siblings. Problem: the fathers half siblings are 3/4 sibs. In other words, all 3 suspects on side A share the same father, but two are from one mother and the other is from that mothers sister. What do you think? I am at a loss and am trying to learn on how to proceed. Thanks! Best to recruit a sympathetic cousin on that A side and get more people tested, preferably descendants of the 3/4 brothers. When it is that far back, people tend to be less fussed about the possibilities. thanks! the 3/4 are brother and sister, and she didn’t have any children. the 3/4 brother had 4 children that appear to all be passed away now but i will try to find if they had children. the “whole” brother had three children, one is still alive, he is the one that is my 328 match. i wrote him, but no response. he is elderly and i imagine would have children that are in their 50’s. i haven’t seen the mcguire diagram yet, i’ll check that out! i love Leah’s WATO tool, but it’s not ready for 3/4 siblings yet she said, but she hopes to make that a thing in the future! thanks for all your help!! Thanks for this interesting information. 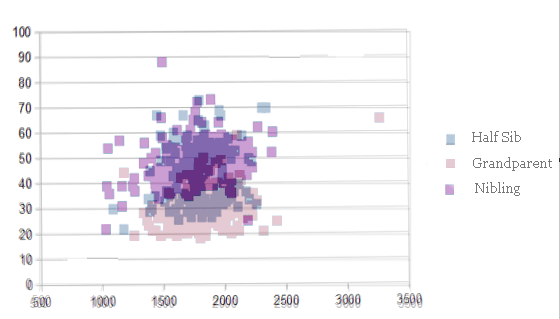 I have a scatter plot like yours that I think I found buried in an Ancestry white paper. The cM axis is plotted on a logarithmic scale, which seems useful. I would be very interested in seeing this work extended to include 1C, 1/2 1C, and 1/2 nibling relationships. I had no idea that it was possible to distinguish paternal/maternal relationships by segment length like you have here! Nice. Your blog is wonderful and such a help to so many people! I’ve never known who my biological father is so I bought a dna kit from Ancestry. I found what I believe is a half sibling (1732 shared cms across 47 dna segments). Using other matches and after contacting this half sibling I felt pretty confident that I had found who my biological father was. Pretty simple as these things go so far, right? I also found 5 other half siblings by the same man and have been in contact with 3 of them. According to what I’ve been told there is a possibility that the oldest son could possibly be the biological father of a half sibling who is a year younger than me. This makes me wonder if the oldest son could possibly be my biological father as well. The half sibling that I matched with is the youngest of all the known siblings I’m aware of so there is a possibility that they are the child of the oldest son as well. To my knowledge none of the others have done any dna testing although the ones I have talked with seem interested in doing so. I have not spoken with the oldest son yet. If he would do a dna test then that would take care of any questions, but I’m not sure if he is open to doing that. Do you have any suggestions for how to determine who is a half sibling vs. an aunt/uncle? 4 of the children were by the same mother. The remaining 3 (including me) all have different mothers. I read your article about sisters with the same father sharing an X chromosome was thinking that might be the best route to go if the oldest son doesn’t do a dna test. It is also my understanding that some others in this family have tested on 23 and me instead of Ancestry. I am thinking about doing a dna test with them as well since I don’t know if I can convince everyone to upload their data to GEDmatch. Also for those who haven’t tested yet do you have a recommendation on which company I should suggest they use for this purpose? Thank you so much! You have pretty much answered your own questions. Yes it would be a good idea if you tested at 23andme as well so you can see the size of the segments in order to look at the charts in this article to determine if they are half siblings or aunt/niece relationships as well as see the X for those female half siblings who have tested there. For analyzing these close relationships, 23andme is better because you can compare everyone to each other in a chromosome browser, whereas you have to get ancestry testers to upload to GEDmatch. Thank you for your quick reply! Hopefully everyone will end up testing. I appreciate you verifying that I’m on the right track and the suggestion for using 23andme. I didn’t realize you could do comparisons like that with them. I wanted to buy a kit using your affiliate link but it isn’t working right now. All the rest of the links seem to be working except for the 23andme. I can give you an example of an aunt and niece who share the entire X chromosome. My brother Bernie and my sister Kim share the entire copy of the X chromosome. Obviously, for Bernie this is his only copy and for Kim it is her maternal copy. My brother Bernie also comes pretty close to matching my sister Kim’s daughter Sarah across the entire X chromosome. The difference is that the Kim ended up passed on a recombined X to Sarah. The first 11 cM of Sarah’s X chromosome matches her maternal grandfather’s X chromosome (1-8.582.558; 11.06 cM; 763 SNPs). The remainder of Sarah’s X (8,343,595-154,282,391; 171.54 cM; 13,846 SNPs) matches her uncle’s X chromosome — and therefore came from her maternal grandmother. I am aware that there’s some overlap on the matching between my father on Sarah’s X, and the matching Sarah has with my brother (which actually reflects the part of the X chromosome Sarah inherited from my mother). This is likely due to Sarah’s paternal X chromosome making it more difficult to determine the exact start-stop points of the matching on her maternal X.
I am trying to determine if an unknown match is a 1/2 cousin(Same paternal grandfather) or a 2nd Cousin(sharing a set of great grandparents).Note this one set of great grandparents were Jewish. None of the other great grandparents were however. Unknown matched in age to myself, and her father was born about 1 year before mine. I match the unknown at 542cM, 14 segments, largest segment is 155.35cM. 7.28% match overall. This is substantially higher than my known Paternal second Cousin whom I match at 2.94% and unknown matches at 3.25%. Can I assume since the values between my second cousin and I, as well as my second cousin and the unknown are close, that a second cousin relationship is true between my second cousin and myself, as well as between my second cousin and the unknown. If so does this prove the unknown is a 1/2 cousin to myself since the values are doubled? Even with 1/4 Jewish endogamy could the relationship % be skewed that much? Unfortunately there is no way to obtain additional dna from other parties as they are deceased. Thank you.. I was not aware that 2nd’s or higher were not skewed!! Ok now things get strange. I switched over to Ancestry.com to get more results and My only known Paternal 1C (whom matched me at 1042cM and 22 DNA segments) only matches the unknown at 287cM? Her father, my only known paternal uncle(matches me at 1825cM 55 Segments)however he only matched the unknown at 492cM? Unknowns father was product of an affair/ one night stand….The mother is deceased and took the identity of the father to her grave. DNA is the only way to solve this mystery. The probability tool gives a 2 to 1 that my grandfather is the father. The tool also gives me an 87.58% chance of being the unknown’s 1/2 cousin, however it only gives my uncle a 4.6% change of being the unknowns 1/2 Uncle, but gives a 89.51% chance of being their 1C1R. Is it possible that the DNA passed from my grandfather to my father and to me was different enough from the DNA he passed to my Uncle and my cousin to explain the above results? Ancestry removes macthing DNA segments that are “population specific” and while this reduces the noise Jewish matches, it also reduces the real amount of matching jewish DNA, sometimes too far. Get that paternal uncle to upload to GEDmatch and look at it there. I am so thrilled to have come across this blog today! I could use some input from you (or anyone else really). I submitted a DNA sample to Ancestry a couple years ago. One of my half-sisters (my mom remarried) submitted her DNA around the same time and she shows up at the top of my list for DNA matches (1739 cM across 54 segments). Several months after, a new match came up as a first cousin in second place on my list (904 cM across 34 segments). This cousin is the daughter of my dad’s sister. My dad left me and my older sister when I was a baby, and I have had zero contact with his side of the family until 10-15 years ago when I have become connected with a few cousins and some uncles (mostly thanks to Facebook). This cousin and I have since met and she’s into family history, so I’ve learned all kinds of stuff. Anyway, another DNA match showed up on Ancestry several months later (so just a few months ago) that has bumped my cousin down to 3rd place in my DNA matches. This new match is a female who also matches with the cousin I’ve mentioned. This female shares 1482 cM across 42 segments with me and 1136 cM across 40 segments with my cousin. The current theory is that this female is my half-sister that perhaps my dad isn’t even aware of. We thought maybe a niece because she is 18 years younger, but her DNA match with my cousin seems too strong for her to be a niece (since it appears they would be cousins). Also, my dad has a track record of going for younger women (as did his father!). I’ve used the Shared cM Project to try and determine our relationship, so we think half-sister is the most logical option right now. This female’s mother believes Ancestry has made a mistake and that there’s no way she’s related to me. Maybe it’s because the mother is a native of another country and has lived there most of the time…except for a couple of years in the USA right around where my father lives! There is a lot of background info that I won’t get into right now, but there’s a lot of “coincidences” that we cannot ignore. I uploaded my Ancestry DNA to GedMatch several weeks ago along with my cousin and half-sister’s just to see if I could learn anything new. I uploaded my half-sisters just to gain perspective of what it I might see with a half-sister. I’m trying to get the new female’s DNA uploaded to GedMatch. I’m not completely sure what to look for, but other comment’s I’ve read seem to focus in on multiple segments that are over 100 cM. My half-sister and I have two segments over 100 cM, the largest being 178.9 cM. I know the thresholds are a little different between the default settings on GedMatch and what Ancestry uses, but my half-sister and I show 1776.8 cM across 49 segments on GedMatch. I’m wondering what clues will be the most relevant to me if I can get the other DNA uploaded to GedMatch. I’m also interested in what I read earlier about there being differences between shared DNA depending if a half-sibling came from the mother’s side vs the father’s side. On a side note, we’ve been evaluating more DNA testing options (specifically to test for half-siblingship) to see if we can get some answers. Various test labs look at different numbers of segments (e.g. some test 24, some test 25, and I see some that test 35 or 46). There’s typically a higher cost as the number of segments increases. I’m wondering if the additional segments are that much more helpful (even necessary) to get a more accurate answer. Virtually everyone on my dad’s side that is aware of this situation has not been very helpful in solving this mystery. We think our only option is to do more testing, but from I’ve read, these types of tests have a decent “inconclusive” rate, so we may not find out anything more than what we already think. I’m open to suggestions about how to utilize GedMatch or things to consider pertaining to additional DNA testing. I swear, it seems no one from this female’s family or my dad’s side of the family wants to get involved with DNA testing or anything else that would be helpful. At least my mom and older full sister are available to help with additional DNA testing if necessary. The commercial “paternity” type tests are not as accurate as Ancestry for these determinations. Perhaps if she is uncomfortable with GEDmatch. You and she could upload to Family Tree DNA and/or MyHeritage. Yes multiple segments > 100 cM with that total shared are expected for a half paternal sibling. Regarding specific relationships, can shared segments occur on any chromosome at any point, or is there certain areas where shared segments are more likely to occur (e.g. do cousins share on certain chromosomes more often than a sibling)? Shread DNA can be anywhere except the X as she is your relative via your dad. No special locations. Yes at 1170 cMs on Ancestry she could be your half sister. Ancestry removes some segments it considers population specific so you could actually share a bit more DNA than that. Half sisters who share a Dad will always share a full X chromosome. You can see your X chromosome comparison if you both upload to GEDmatch or Famiy Tree DNA (the latter will cost an extra $19 for the tools). You can also see the segment sizes at either of those sites, which usually include several > 100cM as explained above. Kitty thanks so much !!! You can tell how important this article was since you are still getting replies over a year later. I wanted to suggest that you do something with paternal vs maternal cousins, half cousins and 1C1R. I am looking at my own and although the totals are all in the proper ranges, you can immediately tell which side they are on from the number and length of the segments. I came back and reread this and realized I should have expected it. I just think that others need to know this also. If you have written about it previously, I apologize. Thank you for all your fascinating blogs. I have an Ancestry match that shows up on GEDmatch as 1799 shared cm. We also share 1 identical chromosome and another almost (I have to look close to see that it’s not) identical chromosome. Based on your sibling vs nibling post we’re thinking paternal half siblings but for some reason GEDmatch is calculating MRCA at 1.5 which suggests aunt/nephew. I wondered if you might have any insight about this? Half sibling is also listed at 1.5, as are all 25% relationships. Yes you share a Dad unless one of you is the other’s grandparent! I’m adopted and have no info on my biological parents. Ive tested with 23and me and Ansestry and uploaded my info to GEDmatch. My highest match on 23andMe is 5%. However, my highest match on Ansestry is 2,104 cM across 60 segments; a predicted first cousin up to a half sibling. Our closest shared match is 494 cM across 24 segments, which is the highest of all of my other matches. I reached out to this person (via Ansestry) last week but have not heard back. His last visit to Ansestry was in June. What are your thoughts on those numbers. How might i get more info? He is almost surely your half brother, he may not have logged into Ancestry and seen your message. My adopted parents told me the adoption was arranged privately through a Church. I have not been able to obtain any more info. North Carolina’s birth records are sealed and my birth certificate has my adopted parents on it. I will read through the info and check trees, GED & heritage to see what more I can find, and get back to you. Thank you for the quick reply! Thanks so much for your Sibling vs Nibling post and input. I believe my match of 1802 cm with 6 chromosomes > 100cm (GEDmatch largest 214.4) to be a half brother. Still learning however, and I am noticing people mention the amount of shared cm “across” the number of shared segments. According to GEDmatch we share 28 matching segments. Is that a typical amount for half sibling relationship? Also, when I utilize GEDmatch’s one to many function it says we share 1802.5 total cm (autosomal) but when I use the one to one it says we share “total of segments > 7cm = 1799.8 cm”. Which would be the correct amount of cm we share? If you look at the 3rd scatter graph you will see that those numbers perfectly fit a half brother who shares the same Dad as you. One of the contact buttons on Ancestry does not work as well as the other. Green versus orange. Try both. I have no idea why there are two. The other more troubling issue with Ancestry is they do not make it overly easy for a newbie to their site to understand if they do not enable contact by email or through Ancestry a new member will never receive messages. I am convinced many testers never see that option and thousands of potential contacts never happen. I contacted them about that once and they were apologetic, but would take no steps to reach out to a match to at least let them know to enable the function. One other thing. Although NC is a closed adoption state you should check to see if they have a registry for adoptees and families. Sone states have set these up so adoptees and families may register. If a match is found between two parties, if desired, contact is assisted by the registry folks. Some states also have Confidential Intermediary Search programs whereby you can pay for a private search through the state program. Again, both parties have to assent to be contacted. My mother in law, an adoptee, recently had a female close family match on Ancestry. They both uploaded their dna to GEDmatch and per your Sibling vs Nibling post (which has been so helpful to me, thank you) I did a one to one compare and found only 1 matching segment > 100. Chromosome 2 @ 109.4. They share 1466.4 cm over 33 segments and the estimated # of generations to mrca 1.6. When I used the x dna comparison however it shows a full blue bar and says “Total segments > 7cm=196.0cm actual”. Paternal half sisters or nibling? Possibly maternal half sisters (sometimes they get the same X from mom), very unlikely to be niblings. I woudl need to look and see but low size for paternal. Thank you Kitty. We have narrowed down that they have different mothers so are now trying to use GEDmatch to figure out their paternal relationship. They are very excited but I’m a newbie myself so not familiar enough to know which direction to go with GEDmatch at this point. Besides sharing an entire x and the 109cm chromosome they do have a few other chromosomes close to 100…98, 97, 93, 90, 89. Do you have any suggestions, or would you feel comfortable viewing the kits on GEDmatch? I wondered about how he would find out he had a message since he hasnt signed in since June. I dont even think an alert pops up, when you sign back in, that you have a message. So, i think you have to proactively click on the mail button – something that you may not think to do. That being said, Im pretty sure I found him on facebook since the photo on both sites is similar and the name on both sites match. I will see what I can find regarding a registry in NC in the meantime. And ill check out the link Kitty provided. There is a strange man showing as my first cousin (10% in common) & as my aunt’s half-sibling (24%). It would be on her paternal side, as he only shows as a distant relative to my aunt’s mom (my grandma). His age makes it unlikley he is her uncle & my great uncle. The families come from a very endogamous population, hence his distant relation to my grandma also. But we cannot find any surnames in common. So it seems he may not know his parentage correctly. My aunt is sure of hers because all other relations come up as expected for her (ie she’s my full aunt & we have clear relationt to my grandpa’s side). Unfortunately there are no males living on that side anymore to be tested. This man has dropped the topic and is not pursuing it, so there’s no access to his dna to upload elsewhere and examine further. My question is – is it possible that endogamy can cause someone to appear as close as a half-sibling if they’re only a cousin? How much can it really skew expected % of dna in common? Endogamy only adds a small amount to the closer relationships. Starting at 4th cousins is where it skews the results badly … so yes he is likely your aunt’s half sibling or nephew and may not have known that either a) his father was not biological or b) he is adopted. I do not know if you even get messages if you log in unless you click the enable messaging function in the set up pages. I do know if it is evabled, you will get an email from Ancestry, and when you log in, there will be a number in the mail icon corresponding to how many messages you have unread. You might try messaging him through the message app from Facebook. Just be circumspect on the first couple of messages. Follow the good suggestions on contacting matches. Be…vague, suggest you have matches on Ancestry, offer your public tree if you have one. Ask if they are interested in finding out how you may be related. Then let them make the next step. Remember, they may or may not know any of what you do. My sister, brother, myself and my mother tested (all related-Full).We stumbled upon a possible half Brother. What are the 4 largst segments? As the article explains, except for paternal half siblings, it is hard to tell these relationships apart. Here are the 4 largest segments from the comparasion of my mother and possible half brother. I can give you kit #s and more information if you need it. Thank you so much!!! I found this article on your blog while trying to distinguish a 1/2 sibling vs 1st cousin relationship for Ann & Frank. We know (due to others testing) these are the only possible relationships. Ann & Frank have different mothers. We know which one of the two brothers is Frank’s father. Ann and Frank both tested at AncestryDNA where they share 1249 cM and uploaded their results to Gedmatch. As they have no shared segments larger than 100 cM, would you consider them to be 1st cousins? Such as endogamy in indigenous Native Americans of Mexico? Both of Ann & Frank’s paternal grandparents are indigenous Mexicans from the same village. Hi Kitty, thank you for posting this – I have not been able to find a lot of articles that address the half-sibling/nibling dilemma. My mother recently matched with a man on 23 and Me who shares 20% of her DNA and was listed as her grandson (which he is not). He does not know who his father is and we believe it is a male relative of my mother. We are trying to determine whether he is actually her paternal half-sibling or a nephew (based on age, it could be either). He and my mother share 1483 cM over 39 segments. The four largest segments are 150.62 cM, 109.33 cM, 100.34 cM and 87.95 cM. Would you suspect half-sibling or nephew based on those numbers?? I looked at both the scatter chart and segment-length analysis and they seem borderline to me. With 3 segments of 100 or larger, most likely a paternal half sibling. However, paternal side nephew is also possible. If he is the son of one of her brother’s then he will have matches to her mother’s side of the family, so get some cousins on that side to test in order to help out. There are three people A,B and C. A is a male aged 49 , B is a female aged 50 and C is a female aged 65. * A and B share 1905 cM (25.6 percent ) DNA and that would make them Half Siblings. * B and C share 2468 cM (40 percent DNA – Half identical 2468 cM across 60 segments and 510 cM Completely identical around 22 segments) and that would make them full Siblings or Sisters. A and C share 862 cM (11.6 percent ) DNA and that makes them First Cousins. My question is if B and C are full siblings and B is half sibling to A then how can C be 1C to A ? Also If B and C were full sisters then why is their DNA match 40% instead of 50% ? A possibility is that B and C are 3/4 siblings. One parent the same , the other parents being siblings, that would explain the matching with A. The amount of FIRs for B and C is low, 25% is expected. I share 824 with my brother. My aunts 1024 with each other. Also low FIR on the X, my aunts share 1000 FIR on the X. Is the entire X shared? If not, same mother, related dads. I used X-DNA Comparison for the two Kits on GED Match for analysis. Hi, I received a “Close Family” with confidence being “Extremely High” match with my Ancestry DNA recently. This person has made contact with me but has no knowledge of her family history as she was adopted. Is it possible that she is my half sibling? And is half sibling testing available if the father is deceased? I’m an adoptee and did 23andme and found a half-sister and 2-1st cousins. I have talked to the half-sister and we know that it’s a paternal relationship. The 2-1st cousins are from the her dad’s side. I was soon contacted by the one of the first cousins and was told the other first cousin was really his father. The half-sister and I are both struggling to understand I’m a half-sibling or uncle. I share 1664 cm and 32 seg, with her. The other two I share 1038 cm and 24 with her great uncle. The person who was identified as a first cousin with me. His son is 562cm and 23 segments. I spend all day in DNA painter and can argue either way that I’m her uncle or half-sibling. I’m wondering if one of the numbers is a bit of outlier. Does that make sense? Ancestry found a possible paternal half-sister or maternal first-cousin (my dad was an anonymous sperm donor in 1961), with 1,573 shared cMs. My new relative gave me her raw DNA to upload to GEDMatch, and it said our longest shared segment is 100 cMs. Given what you wrote, this would argue for first cousins — but that 1,573 number is very high for first cousins. I’ve put the GED Match results as website below. Is it possible there are so many over-90 cMS shares that we’d still qualify? what I wrote was explaining how to discriminate between half siblings and “niblings (niece,nephew, aunt, uncle) which are all 25% relationships. Yes if nibling is not a possibility half paternal sibling the relationship. One 100 cM segment is good enough. I am adopted, know for sure who my bio mom and family are but didn’t know anything of my paternal line until I realized I was staring at a Close Family match on Ancestry. We match at 1323 cMs across 46 segments. She is for sure on my paternal side. I am curious if you think she is a 1/2 sibling or a full first cousin. There are two brothers and it could be that either one are my bio father. I do not have the ability to look at anything other than what I know on Ancestry. It seems to be in a gray area. Higher than 1st cousins but lower than most 1/2 siblings seem to match. Most likely a half sibling if aunt or niece are not possible. Best if you both upload to GEDmatch genesis or family tree DNA and compare there for detailed analysis like in this article. Thanks! I was leaning towards 1/2 myself. No, she’s not an aunt or niece. I know who all the siblings are for my bio father. She’s either a 1/2 or a cousin. I was told my biofather was married but separated with 2 young children. She and her brother fit that as they are only 2-4 years older than me – she did tell me she only had 1 brother and then never replied after that. I don’t want to bother the family, I’m just curious. I have been able to connect with more distant cousins who were very helpful and had extensive trees where we matched and have put together a lot of my family tree on Ancestry. I have a close match at ancestry whose father was adopted. Circumstantial evidence (their family documents) implied a great-uncle of mine was possibly BF. The adopted father then did test at FTDNA, big surprise shows he is possibly a half-brother of my mother. They share 1864 cM and have (5) segments over 100 cM! My mother is 100% AJ, as was her father. The BM is known and she was not Jewish. Does sharing 5 big, over 100 cM segments “seal the deal” for my grandfather being the BF or is there room for the great-uncle? The conception likely took place on or around VJ Day, birth (of fraternal twins) happened in May 1946. Just trying to rule out first cousin possibility! (also working on trying to get military records, etc.). Thanks for all you do! Appreciate all your info and work. Have read comments & learned a lot. I did 23andme about a year ago. The other night one of my male 1st cousins ( our Mom’s were sisters) tested there also. He said you should get on & sit down. Out of 22 we match some except on 4, 14, 22. Hers says 1090 cm with 43 segments. Her X chrom. I’d appreciate any help. Shouldn’t 23 say possible 1st cousin or 1/2 sibling, since it seems so hard to determine. Oh and I did your calculator suggestion & it said 88 percent. Since your maternal half sister matches him at a normal first cousin level he likely really is a first cousin. Could his dad be related to your dad to give some more shared DNA that way? Do you have any fully identical segments? in earlier years. Is there anyway of determining? I feel 1st, 2nd, etc cousins don’t really matter. But 1/2 sibling instead of 1st cousin I feel like we should know. I presume your sister is a full sibling to you in her DNA? Since she has a normal cousin level match with him and your 4 largest are all below 100 cM then he is really your cousin who shares more DNA with you than the usual amount. No Kitty, my sister is definitely my 1/2 sister. We have different fathers. My sister who’s full will be taking the 23 test, it just will take awhile. Sorry Belinda, you had said she was a half abive, hard to keep track here .. but a maternal half so that is all that matters for the match with your presumed maternal cousin. Just found out from ancestry. Com I have a close relative with 1520 centomorgans, about twice that of my father’s only neice. Estimated date of her conception fits the month before he met my mom. Born same area as dad. Her dad left the picture a month before her birth. Is she a half sister? I recently did an Ancestry DNA test and it came back that I had a male relative from “Close family to 1st Cousin” 1717 CM’ over 52 segments. This came completely out of the blue to me, but the indications were that this chap could be a half sibling. Both my parents are deceased, so both of us took a DNA Half sibling test which came back inconclusive. We decided to do a third and final test but that too came back inconclusive. However, it seems that a different method was used by the “DNA” companies and the term “alleles” was used, one coming back at 0.146 and the later one over 35 markers gave a score of 0.22. It stated that inconclusive scores was anything between 0.1 – 10. Can you help me make any sense of this? Why is it so easy for Ancestry to predict and yet two fully acclaimed government approved DNA test companies cant? This is a massive issue that could affect a family to the extent it could rip it apart. Thank you. With that much DNA in common he is either a half sibling, an uncle, a grandparent or a nephew. Dear Kitty: Thank you for being the ONLY source of information that has helped me try to sort through a perplexing puzzle. But after reading your posts and all the comments, I am still uncertain, and was hoping for confirmation that two men are paternal half-siblings and NOT uncle:nephew or grandfather:grandchild or first cousins. – 1614 cM across 45 segments on Ancestry.com. Ancestry estimated they were close family to first cousins. 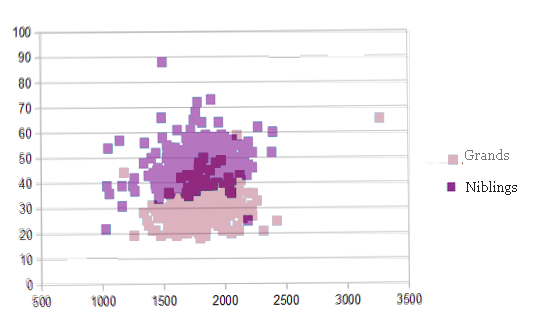 – 1643.4 cM total, largest segment 121.6, overlap 189177 on Gedmatch (using Ancestry raw data upload) separated by 1.6 generations. – 1651 cM across 27 segments on 23andme, sharing 22.2% DNA. 23andme estimated they were half-siblings. They are also related to P, and through an agonizing process of elimination, I thought I figured out who the possible connection might be: M, who is deceased. M’s niece (G) agreed to be tested on Ancestry.com. Both D and C were estimated to be a first cousin to G.
•	G shares 717 cM across 30 segments with C.
Being a neophyte, I thought paternal haplogroups on 23andme might answer the question. •	C’s was R-DF5 (tested recently, using the v.5 chip). So, please help – is this information definitive enough to conclude that D and C are, in fact, half-siblings? (They look a lot more alike than many full siblings do.) For the life of me, given their ages and the first cousinage to G, I cannot figure out how they could have some other relationship. Your logic seems definitive to me. The number of segments and amount of shared DNA (use 23andme numbers) fits perfectly by the above charts plus G’s results fit. Are there any children of M who would test? M has no known children to test. Also no known direct male descendants of Ms father. How do I figure out how many segments over 100 cM there are? 23andme said it was a sub branch but I will check with the admin. And a couple of others that are between 96 and 99 cM. Would you call that definitive, indicative that they are in fact paternal half-siblings? NOBODY knew that M had ANY offspring, and D only found out recently that the rest of his siblings were half-siblings. C had no idea about any of this until the DNA test. Wow. A mystery solved. Thank you thank you thank you. Than you for sharing your knowledge and for the useful resources on your blog. I’ve been able to clarify several DNA relationships thanks to you, but am struggling with a new one that I hope you can help with. This is for an adult female A, and adult male B, 18 years apart, with different biological mothers who come from different geographic areas of the same state. Male B was adopted. 6. The next longest segments are 91.6 cM, 94.89 cM, and 91.49 cM. GEDMatch (uploaded from the same 23andme raw data) indicates 1874.6 cM over 48 segments with an overlap of 52099, but what’s confusing is that there’s only one shared segment over 100 cM: 117.3 cM. What’s causing a discrepancy like this? It’s baffling. And is this a nibling relationship or are they paternal half-siblings? What discrepancy? These are clearly the numbers for paternal half siblings. Thank you very much for replying, Kitty. The sperm donor scenario is not possible for either A or B.
B’s birth mother was a teenager at the time of his birth. A’s parents were married less than a year at the time of her conception, and went on to have four more children in quick succession. A is struggling with the results of the DNA test, refusing to believe that the dad who raised her isn’t her biological father (her dad is also not aware of this) and that she has a brother who’s so much older than she is. She persists in thinking B is her half uncle, despite the fact that there’s already DNA confirmation with a paternal cousin which only further disproves this. Your expert confirmation might help her to accept the results and move forward in dealing with this new reality. Thank you again.